OPEC welcomes Indonesia back as a member with open arms. Set one more place at the table. Photo credit: Osbornb via Flickr. There's been a lot of debate as to whether OPEC's decision to protect its market share would work. Some thought that the policy shift from protecting price to protecting market share would eventually lead to a breakup of the organization, as weaker members would revolt or bolt. That, however, doesn't appear to be the case, as its membership is poised to actually grow in December when it welcomes Indonesia back as a member. Indonesia is poised to rejoin the oil group after a seven-year hiatus. It originally left due to a slide in its oil output, as it couldn't overcome the declining production from legacy fields. In fact, its current daily output of 870,000 barrels is just half of what it was in its peak in the late 1970s. Further, that oil output isn't even enough to meet its own internal demand, which is surging due to its growing population, as it currently holds the world's fourth-largest population. Overall, its daily output ranks among the bottom tier of OPEC producers, and it's 90% less than what Saudi Arabia produces each day. However, because it's a net importer of oil, Indonesia brings something more important to the group: a growing internal market for its oil. One of its selling points to rejoin the group was that it hopes to be a "bridge" between oil producing nations and consuming countries. In return, it wants to gain some influence on policy decisions, as well as increased investments to boost its own sagging output, as well as refining capacity. Once Indonesia is back into the fold, OPEC's membership will be up to 13 nations. Further, it will boost its share of the oil market by 3%. 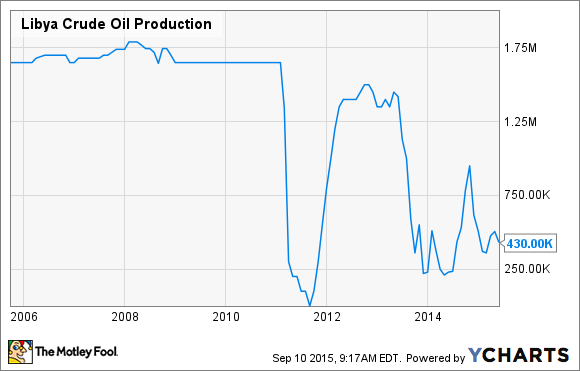 That alone is an important factor given OPEC's new focus on controlling a larger share of the oil market. Due to surging oil production from U.S. shale basins, as well as increased output from places like the Canadian oil sands, OPEC's share of the oil market has been sagging in recent years. In 2014, its share of the oil market was just 41.8%, which was down from 43.3% in 2013, and its lowest level since 2003. Another big contributor to OPEC's declining market share has been the infighting in Libya. Its production is off more than 1 million barrels per day from its peak prior to the uprising in 2011. Further, there have been times where its oil output has trickled out of the country due to export facilities being closed off. Libya Crude Oil Production data by YCharts. In a sense, Indonesia will help offset that Libyan weakness as its production, though declining, is still more predictable. Further, should Libya eventually stabilize and resume output near its prior peak, it has the potential to make OPEC all that much more powerful in the oil market. This will happen if the organization can stick together during the deep downturn in the oil prices, which is really hurting its weaker members. Members such as Venezuela and Algeria have been particularly hard hit by the weakness in the oil price, and both are urging OPEC to call an emergency meeting well before the scheduled meeting in December to discuss an output reduction. However, such a meeting will be hard to sell to other members because OPEC won't cut its output without non-members joining them, because it's much more concerned with its market share than the market price of oil. In welcoming back Indonesia, OPEC will certainly grow stronger. Its addition alone will boost its control of the oil market by 3%. Further, it gives OPEC internal access to a fast-growing Asian nation, which is a region that's key to its long-term growth. Suffice it to say, it's an interesting development for the oil market, as it suggests that OPEC's will might not be so easily broken by low oil prices.